I think it may have been mentioned before that until I met the Better-half that I never had much to do with cats. I grew up in a dog house (not literally!). 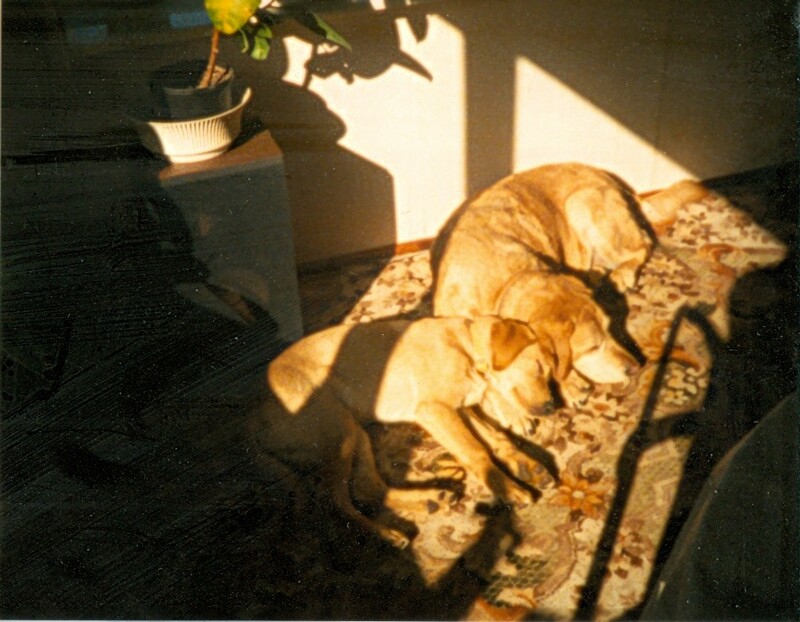 My parents bought their first dog when I was a baby and Lucy (a golden Labrador) used to guard my pram. When she was getting older my parents got her a companion, a not quite puppy (with a royal pedigree) called Leo. When Lucy passed away we were all devastated, but we still had Leo to fill the void. When Leo passed away my parents swore of getting another dog... for about three months. Enter Dodie a lurcher-cross rescue dog. She was followed by Joe, a collie-cross rescue... in case she got lonely. In the meantime I'd moved out of the parental home, got myself a dog, and moved back again. Jack, a bearded-collie cross (and another rescue dog) stayed behind when I moved out for good. Joe, Jack and Dodie were all about the same age and passed away within about 18 months of each other. That was the end of canine keeping for my mother. In the meantime, I'd moved in with the Better-half and his cats Gizzie and Molly. Gizzie was a bad tempered white Persian who eventually decided that she hated us and went to live with a neighbour (you cant make these things up). Molly was a gorgeous black fluffy girl... not given to lap-sitting or playing. I did teach her to wash her face though! This is the difference between cats and dogs... I forget who it was that said "Dogs come when they are called, cats take a message and get back to you". Dogs are needy, they have to be with people all the time - it isn't the same with cats (mostly) they can take you or leave you. Having said that Casper has become quite a people cat. When I'm at home he usually spends pretty much the whole day with me. When I go to work he comes running to see me when I get in (and chew my shoes). He'll snuggle on the bed with me when he's feeling particularly social... and sit nearby when he just wants company. He knows my routine as well as I do. When I get up to go to bed he races to the bathroom, demanding a drink from the tap and some fuss in the bathtub (where is purrs are amplified even louder!). Then he races to the bedroom, either to get first dibs on the bed or jump on the blanket box where he can keep an eye on me. In return for all the feline purrs and head-bumps Casper gets games (chasing balls up and down the stairs, chasing the laser dot, playing with ribbons or toys on dangly sticks); he gets brushed (twice a day at the moment as he's moulting); and generally waited on hand and foot - all he has to do is miaow (or more usually yowl!). I don't know about a dog's life... but it certainly is a cat's life!